no need for a mailing list! If you currently mail postcards for your business and target your customers by a geographic area then this mailing program by USPS is for you. 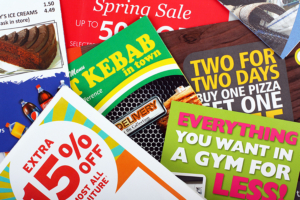 EDDM (Every Door Direct Mail) is a program that enables regular retail businesses to mail at an astounding $.187 per postcard without even needing to have a mailing address. Ranger has been a preferred vendor for EDDM Postcard mailing services since the program rolled out over 6 years ago. We can assist you in creating your postcard and consult with you on preparing your cards for Every Door Direct Mail delivery. We will prepare all of your paperwork for you and bundle the mailing as per exact post office guidelines. Once prepared, we ship the cards to you and all you have to do is drop them off at the post office. If requested, we may ship the cards directly to the post office for an additional charge. Note: Pricing does NOT include shipping nor Postage costs.